The beginning of everything: trip to Rio de Janeiro! I'm on a plane for about 7 hours. I listen to some music while thinking about this new adventure. In a few hours I will land in Rio de Janeiro. It still sounds like a dream. I have with me a guide borrowed from the library in Rimini, to better study the itinerary. Next to me there is a nice Brazilian lady, Magda. We talked a bit and she invited me to her place for the New Year Eve, or better for the Carnival which is the most amazing event here in Brazil. Today I feel a strange, as always when a new experience begins. I put my thoughts in order, as I could enclose my life in chapters. For each chapter, I am forced to think about what I have done up to that point and where I am going. I think it helps me to keep everything under control ( I wish I could have this power!). Moreover, every new journey corresponds to a feeling of nostalgia for both my family and my friends scattered everywhere, who I always miss. But soon that strong desire takes over. It is a kind of feeling that pushes me to continuously move. And I think of all those friends and families I've got to know thanks to this passion. Each of them has enriched me and at the same time has taken away a small part of my soul left with them forever. The best part of changing is that of meeting new people, walking on foreign roads, eating food never seen before and being able to rediscover ourselves. Yes, because with every change we can start over. Every time I close a chapter I feel enormously changed, wiser, more woman, more human. It is something invisible to the eyes of many, but that changes the way I look through my own eyes. I am writing this diary and I've realized that I am happy. I'm listening to Manu Chao, a singer who always puts me in a good mood. Sonia is the reason why I like even the reggae music now. And she is the reason for my trip as well. In a few hours, she will be waiting for me at the airport with Arianna ,a friend of her met during their Erasmus Mundus in Argentina, who will be part of this adventure. Today is also Sonia's birthday and in some ways, this will be her birthday present. I did not think twice about booking the flight and getting there. In addition to being a friend from university, Sonia has become my best friend and my fixed anchor among all these changes. And with her I have the guarantee that every trip will be unforgettable! It's 6:35 pm and in 3 hours I will be in the big metropolis. I'm about to enjoy a crazy sunset from my window. It is the part that I love most of the whole journey (besides sleeping like a dormouse between one movie and another). And here we are finally together in Rio de Janeiro. We stay at the Misti Hostel Copacabana, a decent hostel for 10 euros per night. Let's go straight to Mount Corcovado to visit the famous Christ the Redeemer, 38 meters high and counted among the seven wonders of the modern world. After a long wait and paying about 15 euros, we can finally get on. The city view is breathtaking and it still seems like a dream to be here right now. 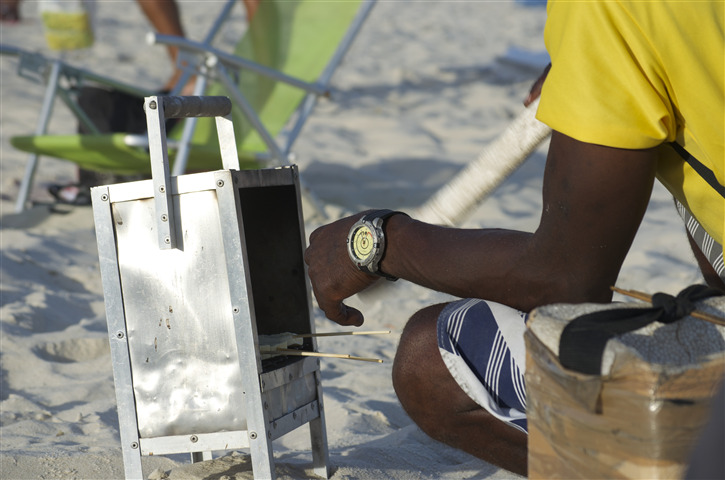 We lay then on the beach of Copacabana to taste for the first time the real Brazilian Caipirinha, made of cachaça, lime, brown sugar and ice as well as an excellent cheese (queso asado) roasted directly on the beach. In the evening we go for a tour of the neighbourhood to enjoy some local music together with a good beer and some new friends. The next day we buy a Favelas Tour at our hostel for around 20 euros each. It is undoubtedly the part that strikes us the most. Vicente, a Brazilian guy who studies international relations and teaches capoeira, is our guide for today. He brings us to the southern-west favela: Rocinha. We go up to the hill by motorcycle-taxis. The name "favela" indeed comes from a type of tree with large and resistant roots, just like these small houses built in positions that defy gravity. Once on the top, we begin to walk down while Vicente tells us a little about the life here. We are faced with a totally different reality: we walk down dirty streets, where the garbage is collected in some corners of the road and the electric cables look like a black tangle. Here, in fact, it is cheaper to add a new cable rather than repairing the damaged one because the important thing is that things work, not that they are pleasant to see. We enter a house of a man who has now left it in the hands of local young people to make it a hostel. It has a strategic position on the city with an incredible view. From here you can clearly see any district of the city. Vicente explains that the West is the most recent in which there are the richest houses but where among the poor there is a mafia, called militia, which asks them for money in exchange for a miserable job. The southern part is instead accessible to the favelas tour thanks to a pacification process in progress since 2008. In fact, it aims to decrease the amount of heavy weapons and at the same time reduce the number of (corrupted) policemen who cause many innocent victims involved in the shootings. This is what happens daily in the North, up to the hill, where most of the poor people live, therefore the government does not care at all. This area is in fact inaccessible to any tourist. Unlike the southern part that has developed thanks to the tourist areas of Copacabana and Ipanema, in order to give a place where to live to all workers in the area. This part (the one where we are now), therefore, is quite safe, except for some points of drug dealing in which Vicente has expressly forbidden us to take pictures. In the streets, we stop to admire the colourful street arts. Many of them are attributable to the young artist WARK whose main subjects are angels. Vicente even takes us to his laboratory to meet him! During the walk, our friendly private guide makes us taste some delicious cheese balls - called pan de queso - made with tapioca flour (also gluten-free), and an excellent Açaí, or a granita obtained from the homonymous fruit mixed with guarana syrup. We spent only a few days in Rio, but we are fascinated, not really for the caipirinha on the beach, or the skyscrapers close to the famous Copacabana, but for the essence of this city and its people. In particular, the normality of a life lived between drugs, shootings and crime has really marked us. But even more, we are impressed by those people who do not give up and try to change something for the future generations. It has been a great start for our Brazilian tour and Arianna, our official photographer, is a really good travel mate too! Next stop: the wonderful Ilha Grande.